Johannesburg, 14 April 2019 – Amongst other imperatives, South Africa’s manufacturing sector – including its metals and engineering (M&E) cluster – needs innovation to spur industrial growth, the Steel and Engineering Industries Federation (SEIFSA) said today. Empirically, there is a growing body of work which generally highlights a strong positive correlation between innovation and industrial growth at the macro level and also between innovation and firm revenues at the micro level, the Federation said. It added that numerous research studies had reported that the most innovative companies overall were growing significantly faster than the least innovative. SEIFSA said the recorded difference for industrial manufacturing companies was dramatic, with the most innovative companies recording growth levels which were over four times those of the least innovative companies. However, despite this empirical evidence, the M&E cluster is generally considered a laggard in innovation and technology. “This is one of the chief reasons why we established the SEIFSA Awards for Excellence. We wanted to encourage innovation and to celebrate excellence in the metals and engineering sector,” SEIFSA Chief Executive Officer Kaizer Nyatsumba said. “In such volatile economic times and a challenging business environment, we at SEIFSA believe that companies operating in the manufacturing sector in general and the metals and engineering sector in particular should invest in innovative technological advancements if they are to compete successfully with international players. “We also believe that it is of critical importance that companies that excel at what they do get the acknowledgement and recognition they deserve. This is another reason we established the SEIFSA Awards for Excellence,” Mr Nyatsumba said. Last year, adjudicators in the Most Innovative Award category were impressed by the work done by the winning company, Denwa Engineering, which used its invention in the form of a MaMoo Trailer to design and manufacture a product with local material and labour, instead of importing from an overseas-based company at an exorbitant cost and with little value add from South Africa. This year, winning companies will, once again, be celebrated during an annual gala dinner to be held on 23 May 2019 at the IDC Conference Centre in Sandton, Johannesburg. Entries for the Awards close on 26 April 2019 for all categories. The Most Transformed Company of the Year Award will be received by a company that showed the highest transformation level in its ownership and the composition of its Board of Directors, Executive Management and Managerial Team between July 2017 and December 2018 (this award category pits companies employing fewer than 100 people against those of similar size, and companies employing more than 100 people against others of similar size). Mr Nyatsumba encouraged companies operating in the metals and engineering sector to submit their entries for the seven categories before the deadline date of 26 April 2019. Participants can enter by visiting the SEIFSA Awards website (www.seifsaawards.co.za). 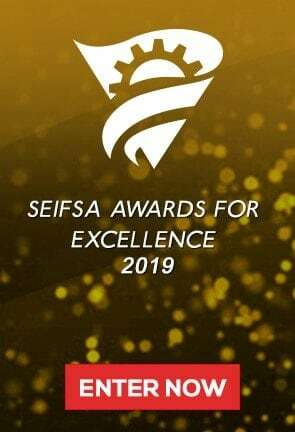 The Awards are open to all companies in the metals and engineering sector, and not only those that are members of Associations affiliated to SEIFSA. Awards winners will be honoured at a ceremony that will take place at the IDC Conference Centre in Sandton on 23 May 2019.